As we live in the woods, we have many rodents such as mice and rats in the area. Recently we have had rats in the engine compartment of our vehicles. They have been leaving droppings and pulling the insulation from the hood of our pickup. They use the insulation and other materials to build nests inside the engine area. We needed to find a good solution to repel these rodents and drive them away from our vehicles. 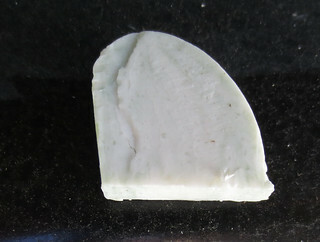 I took a bar of Irish Spring soap and cut off a small piece about 1 inch long. I then cut that piece in half ending with a piece of soap about 1 inch square as shown. I placed a piece of soap inside the engine compartment on the battery tray as this was one of the places we have been seeing droppings. I repeated this process for all our vehicles. Then I waited and watched. Apparently the strong soap smell from the Irish Spring soap repels the rodents. Since I have placed the soap pieces inside the vehicle engine area, we have not had any signs that the rats have been back. This idea may also work well for other areas where you do not want mice or rats such as your house, sheds, or garages. Give it a try and let me know how this rodent repellent works for you. **Follow-up comment – I am hearing from several of you that this doesn’t work. I am adding a warning to others to beware that this may not work on mice. Please read the comments to see the outcomes of others. I read that cayenne pepper can be helpful at keeping pests away. Apparently mice, squirrels and other pests don’t like the smell of cayenne pepper. I have been having a problem with mice getting in my greenhouse and eating my tender seedling plants so I wanted to give this idea a try. I have also read that ants and some other bugs don’t like cayenne pepper either so this may be a good solution to deter them too. 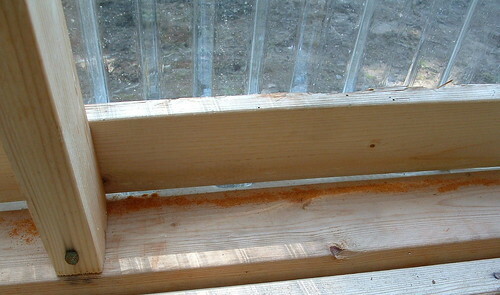 I bought a 50 cent bottle of cayenne pepper and have sprinkled it generously all around the greenhouse as shown above. So far it appears to be working. My seedlings haven’t been getting eaten overnight like they had been but lets give it some time to see if this really works. It’s been about a week now since I first spread some cayenne pepper around in my greenhouse. The plants have been left alone and it doesn’t appear that anything has been getting in and eating them. So if you have been having problems with mice or other such pests, you might try this useful idea of applying cayenne pepper around the area to repel them. Application: Sprinkle the cayenne pepper all around areas where you want to keep the pests away. Especially apply cayenne pepper in holes and openings where the pests are entering. Re-apply every few weeks to keep the strong smell present for the best results. I’ve been having a problem with mice getting into my greenhouse and eating my tender seedling plants. The mice appear to really love my tomato starts and have been eating the leaves off my starter plants. I have been trying to think of a solution and came up this idea. 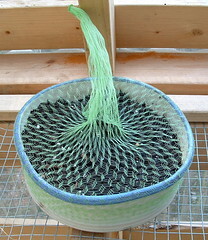 I used recycled lettuce netting that comes around the lettuce I buy to protect my plants from mice. 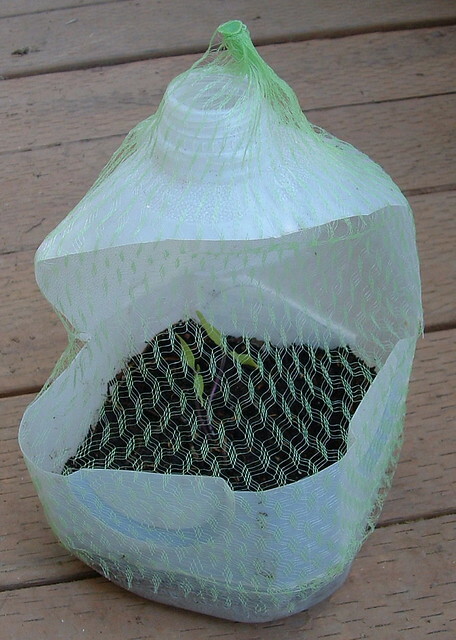 These plastic nets fit over the milk jugs that I have seedlings in as well as over smaller pots that I am using for plant starts. The nets are working great. I can water the plants and they get sun and air but the mice can’t get at the plants or seeds. So far I haven’t had any problems since covering my seedlings with the produce nets.